Why Shouldn’t You Buy Your Engagement Ring On Freddy Diamonds In 164 Words? We suggest that you don’t buy from Freddy Diamonds because these are natural diamonds with flaws, which are engineered to mask its flaws through inclusions with laser or glass. Popularly known as enhanced diamonds, Freddy Diamonds uses laser and glass filling for removing flawed inclusions on the naturally flawed diamonds. The refreshing fact is that, unlike most diamond geezers Freddy is honest about what their diamonds are and aren’t. Freddy diamonds work on one equation, more the flaw or inclusions, lesser the price. FD claims that the Freddy Diamonds are 100% real diamond, mined from earth. They buy tiny diamonds with varied ranges of imperfections, then, treat those inclusions with lasers and glass to fill it. Apart from the controversial nature of the diamonds, we also found customers claiming that they experienced extremely rude behavior from FD as well, which was the reason they did not buy at FD. However, majority of the successful verified purchases vouched that the customer satisfaction was rated 100%. Why should you buy your engagement ring on Freddy Diamonds in 444 words? With a unique No Bull (100%) Satisfaction Guarantee, Freddy Diamonds is one of the topmost diamond engagement ring sellers online for couples looking for an affordable buy. The guarantee covers all dissatisfactions, size issues and other 100% refund validity on the items bought from FD, online or offline. Apart from the fact that all promises and policies of Freddy Diamonds are ‘No Questions Asked’ to the customer, you will have an everlasting wedding purchase when you shop with Freddy Diamonds. An iron-clad guarantee that covers all dissatisfaction on the customer’s side when returned within 30 days of purchase, this money-back policy is strictly a no-bull guarantee. Make sure to include your original sales receipt as well as the item in its original packaging when you return a Freddy Diamonds online purchase. The jewelers’ also processes the exchange option, if refund is not the choice of the customer. Freddy Diamonds truly understands that a wedding ring purchase should be everlasting, both emotionally and financially. The company provides a limited Lifetime warranty on all its products, under which every product of Freddy Diamonds are covered under the warranty for manufacturing defects for a lifetime. FD also offers free of cost ring re-sizing at any point after the purchase for the same owner. Commonly known as Clarity Enhanced Diamonds, these diamonds are also 100% real or natural as any other conflict-free diamond. However, the catch is that these are repaired to diminish the inclusions to make a bigger diamond that is 40%-50% lesser than the usual cost. FD uses laser and glass filling technology to keep the diamond secure, safe and invincible. Unlike the silicone fillers that expand with heat, laser filled inclusions are unmarred and untraceable! Apart from the shocking affordability of the diamond prices, all Freddy Diamonds jewelry is also liable for free of cost shipping. Unlike most diamond sellers who give multiple shipping option and never even a free standard shipping, Freddy Diamonds is all about benefitting the customer. When you shop with Freddy Diamonds, the payment options are plenty and convenient. You can conduct your diamond purchase payment of FD with online payment portals like PayPal, or via eCheck or credit cards like Discover, American Express, Mastercard and VISA. All the products from Freddy Diamonds are provide with a Gemological Institute of America (GIA) Graduate Appraiser. This reports the accurate grading, value, weight, inclusions and cuts on your diamond engagement ring from FD. Began in 2005 by Freddy, Freddy Diamonds today is a global diamond seller with clients, both exorbitantly rich and poor. Offering around 50% discount in diamond rings and valuable gems, like no other diamond geezer, Freddy Diamonds is surely a catch! One of the trustworthy and honest diamond sellers online, buying from Freddy Diamonds has been positive and stunning a deal for 90% of the online engagement ring buyers. FD provides gems that are bigger in size, owing to its discounted diamond price. Hence, customers could for the first time, opt for a bigger and hefty looking diamond, with the cost of diamonds half its price. An established diamond seller since more than a decade, Freddy Diamonds has an 100% satisfied customer support. Most of the verified reviews that we found online report that FD offer a generous customer service apart from its honest deals. At Freddy Diamonds, the artisans are highly skilled to provide for bigger diamonds with flaws that are invisible even to a 10x magnifying glass of another diamond geezer! The enhanced diamonds from FD are filled efficiently with laser or glass, unlike cheap diamond fillers that use silicon, which expands under high heat. When purchasing from Freddy there is a 100% risk protection as well as money back guarantee with 100% refund when returned within 30 days of purchase. The risk free shipping that is also free of cost is also a unique badge of trust when you shop with FD. Most customers exclaimed that, unlike Standard Shipping option with most diamond wedding ring sellers online, Freddy Diamonds offers a speedy shipment and delivery. With multiple payment options with PayPal as well as varied credit cards, finding your dream engagement ring to pop the question is a plain-sail! Given that the diamonds are bigger in size; your mate will jump with joy and an ‘I Do’ as soon as he or she sees the ring! If you’re worried whether your lover would truly love the precious ring, you can rest assured that Freddy Diamonds also offers free resizing as well as 100% refunds and easy returns. This highly affordable and cost-efficient diamond seller is renowned for its efficient and direct service. Most customers were overwhelmed when shopping with FD as talking directly to Freddy was guaranteed. If you’re worried about anything about your treasured diamond purchase, feel free to contact Freddy Diamonds at the toll free number- (212) 265-1915. An unaccredited company on Better Business Bureau, unlike the usual unaccredited diamond geezers, Freddy Diamonds also has null complaints registered on BBB for the past three years. As for other trustworthy sites like Yelp, Wedding Wire and Trustpilot, 99% of the customers had 5-Star ratings and honest referrals for FD. Is Freddy Diamonds a Fraud? Not. Freddy Diamonds is a trustworthy online diamond seller who is transparent about everything that their diamonds are and aren’t. In this age, when diamond sellers try to con the customers selling wrong and exaggerated facts about their origin, history and products, Freddy Diamonds is the ideal example of a genuine seller. According to our diamond experts and their unbiased opinion, we recommend Freddy Diamond Jewelers to all those who are looking for cheaper 100% real diamonds that are enhanced with an added assurance from the manufacturer. Freddy Diamonds sells original and genuine diamonds that are enhanced with laser or glass fillings to mask the inclusions, flawlessly. Additionally, FD also provides 100% refunds and exchanges for the products sold, apart from its Graduate Appraiser certification from GIA, which is provided alongside the purchase. An easy to navigate website with information organized responsibly and transparently, we loved shopping on the Freddy Diamonds Official Site. Shopping is easy as the online portal provides detailed ring customization including, weight, stone type, diamond type, cost and settings of the diamond. The picture provided are not blurred, crystal clear and responsibly displayed in bright setting to provide an in-depth look on the diamond. With over thousands of customized and established designs, Freddy Diamond offers a wide variety of high-quality diamonds with inclusions. For exclusively, Wedding Jewelry shoppers, there are high-priced enormous diamond rings to petite and elegant tiny ones for extravagant to vagrant rates! FD also gives diamond giveaway offers like, Diamond engagement rings costing more than $1000 at FD are subject to another 20% discount! The website offers a prompt shopping support with a pop up ‘Contact Us’ window apart from the email contact form. 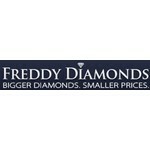 When we requested shopping support, we were responded within 24 hours from Freddy Diamonds from a staff. Our subsequent order placement and shopping experience was stellar as the FD staff helped us pick the perfect product that we had in mind, additional to the great expert advice we were given by the qualified staff! Payment options are varied, when you shop at Freddy Diamonds. You can pay via PayPal or Credit Cards like American Express, Discover, MasterCard or VISA as well as e-Check. All shipping charges are provided free of cost for Freddy Diamonds purchases and each item is individually insured by FD. Freddy Diamonds also ensures 100% refund upon returning the product within 30 days of purchase as well as lifetime limited warranty and free re-sizing options for repair and services on defects of craftsmanship. I have met and worked with Freddy in the past. He knows more about diamonds than just about anyone I know. He is upfront that his diamonds are a lower grade. That’s also why his prices are lower. His customers can get 2 to 3 more carat size for the same price as a higher grade 1/2 carat. He honors his customers with 100% satisfaction guarantee. TLDR; You would go to Freddy because you want a big rock at a cheap price. You know what you’re getting with Freddy.